The wheel/rail interface must be managed in order to increase the life of rail and rolling stock components and to reduce in-service failures. This was one of the primary messages delivered at the Association of American Railroads/Transportation Technology Center, Inc.’s 14th Annual Research Review. The research that was presented covered a range of topics directed toward meeting the industry’s technology goals, and many of them fell within the realm of wheel/rail interaction. Wheel/rail interface management includes the design and maintenance of wheel and rail profiles, friction control, and automated measurement of wheel/rail interaction, said Semih Kalay, TTCI’s Vice President for Research and Development. Automated wayside and onboard systems are being used to inspect rail and joint bars and to measure rail stresses and track strength. Automated wayside or onboard vehicle health monitoring systems are also being used to monitor the condition of rolling stock and to identify poorly performing vehicles, which increase derailment potential and the overall stress state of the railway. Condition monitoring enables railways and car owners to schedule the necessary maintenance on a proactive basis, thereby reducing risk and maintenance costs, he said. 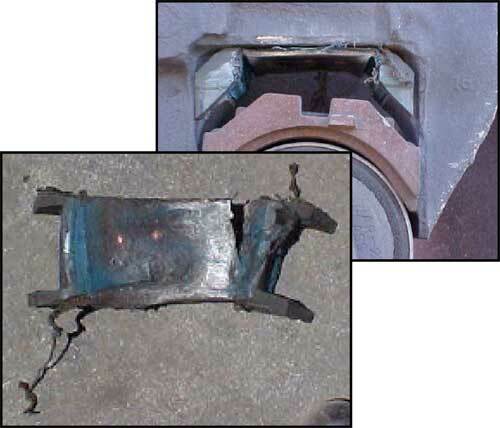 Wayside condition detectors, such as acoustic bearing and cracked wheel detectors, performance detectors (such as truck hunting, truck performance and wheel impact load detectors), and wayside machine vision technology (such as wheel profile and brake shoe modules) are able to report on vehicle and vehicle component condition in lieu of visual inspections. Condition monitoring systems have enabled researchers to compare wheel tread temperatures to hot and cold wheel detector readings in order to determine limits for thermally related wheel tread damage. “Research has shown, for example, that average wheel temperatures are approximately 150 degrees less than tread temperatures,” said Harry Tournay, TTCI Senior Scientist. The goal is to use wayside detectors to relate wheel temperature to brake conditions, including applied hand brakes and stuck or inoperative brakes. The overall objective of automated vehicle health monitoring and inspection systems is to use the best available technology to identify poorly performing equipment and potential safety problems before they cause rail damage or accidents. Continuous streaming video is also being used to identify missing or damaged car safety appliance components. The TTCI reported that since the implementation of wayside detection and technology systems, the broken rail accident rate was 7.6% lower. The broken wheel accident rate was 17.2% lower. The combined broken wheel and rail accident rate per million miles was reduced by nearly 10%. Between 1997 and 2006 there were 72 train accidents attributed to truck hunting in the U.S. Between 2006 and 2008, the period in which the Advanced Technology Safety Initiative (ATSI) truck hunting program (which relies on the implementation of detector-based condition monitoring) was launched, there have been no train accidents attributed to truck hunting on mainline track in the U.S. Among the objectives of the Strategic Research Initiatives of the Wheel/Rail Interface Management project is to investigate the root causes of loaded car hunting, and to develop recommended standards and practices to eliminate the problem. “The symptoms of loaded car hunting include the failure of adapter pads on M-976 trucks during hunting,” Tournay said (see Figure 1). Tests showed that hunting of loaded cars is the result of the inertial and suspension characteristics of the carbody interacting, dynamically, with the self-centering properties of the wheel running on tangent rail. “Normally, the warp restraint of the truck is sufficient to stabilize the wheelsets,” Tournay said. Under the action of loaded hunting, however, the wheelsets, constrained relatively softly by the adapter pads, excite the carbody in yaw. This saturates the friction of the wedges in the truck suspension, breaking-down the truck warp and reducing, substantially, the wheelset constraint, leading to wheelset hunting. The steering properties of the wheel profile have been evaluated on both tangent and curved track. A wheel profile matching the worn high rail and providing effective steering in curves has been found to produce excessive conicity and self-centering action on tangent track (see Figure 2). Rail profiles rolled and maintained by grinding to a slightly modified profile will result in lower conicities and improved dynamic behavior. Interim solutions to the problem of loaded hunting include the use of stiffer adapter pads. Longer-term solutions include implementation of redesigned rail and wheel profiles, such as the SRI-1A, which has shown to wear less than the AAR-1B, which produces severe two-point contact with typical worn high rails on curves (see Figure 3). Huimin Wu, Principal Engineer, reported that wheel performance was evaluated by examining track gauge spreading forces, flange and tread wear and the wear patterns. The new SRI-1A wheel profile was also tested. 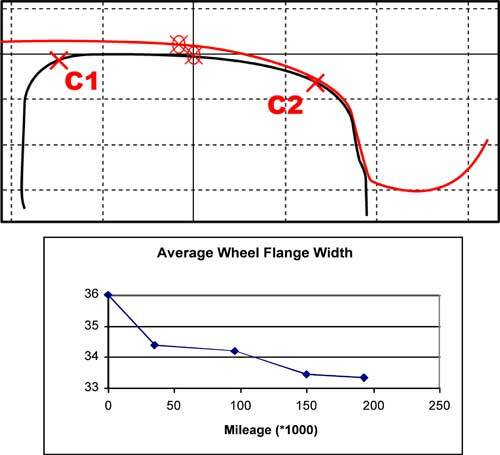 Results showed that the SRI-1A wheels produced lower gauge spreading force in the beginning stage of service, and less wear than the AAR-1B profile wheels in service tests (see Figure 4). The SRI-1A wheels also produced relatively even wear across wheel profile, while the AAR-1B wheels concentrated wear at wheel flange and tread. Existing as-rolled rail profiles are also being redesigned through a joint effort with AREMA Committee 4 to be more compatible with the worn wheel shapes, Wu said. New rail grinding templates and grinding practices, which will reduce conicities, creepage, contact stresses and material flow, are also being examined. Friction Management is another aspect of vehicle/track interaction that continues to warrant attention. Toward that end, the TTCI presented the results of a two-year study of wayside-based top-of-rail (TOR) friction management in the Tehachapi Mountains. The TTCI monitored two five-mile zones: a control zone with optimized gauge-face lubrication, and a TOR zone with gauge-face and TOR lubrication. Performance was monitored for more than two years on two similar 10-degree curves with identical head-hardened rail and the same train traffic. After 80 mgt of traffic, rail wear was reduced by up to 60% in the TOR zone, compared to the non-TOR control zone. The life of the low rail at 80 mgt per year with a 3/4-inch wear limit (not adjusted for metal removed by grinding) is projected to be nine years in the TOR zone compared to four years in the non-TOR zone. “Top of Rail lubrication reduces rail wear and offers the potential to extend rail life,” said Joseph LoPresti, Senior Principal Engineer. No research review would be complete without an evaluation of the performance of the latest generation of premium rail steels under heavy axle loads. The TTCI monitored the performance of five rail steels with an average hardness of 410 Bhn in a non-lubricated, 5-degree curve. After approximately 425 mgt (at the existing wear rates), 550 mgt of wear life is projected for the rails in this nonlubricated curve. Field tests conducted in revenue service on eastern and western revenue service coal lines as part of the Heavy Axle Load monitoring show excellent wear performance. The minimum projected rail wear life (not expected life) of 5/8-inch gauge-face or head wear is 1,000 mgt for a 10-degree curve with excellent gauge-face and TOR friction modification, and 2,800 mgt for a 2-degree curve with fair gauge-face and no TOR lubrication, said Dingqing Li, Senior Principle Engineer at the TTCI. No internal defects were identified at the east coast site after 180 mgt, and after 760 mgt at the west coast site. At the eastern site, there was no obvious rolling contact fatigue after 180 mgt, a period during which no preventive grinding was performed. At the western site, rail grinding was required after significant rolling contact fatigue (RCF) appeared on the low rails of 2-degree curves after 300-350 mgt and on the high and low rails after 680 mgt. “Generally, we’re seeing fewer internal defects and more surface defects,” LoPresti said. A prototype automated Wheel/Rail Contact Inspection (WRCI) system was developed to monitor wheel/rail contact conditions in order to determine the need or priority of rail maintenance (see Figure 5). When used on Norfolk Southern and BNSF the WCRI system identified track segments that could cause poor wheel/rail interactions, such as contact toward the field side of the low rail, which can increase the risk of rail rollover derailment, and severe two-point contact, which can induce high gauge-spreading forces. One of the priorities identified in the AAR’s Technology Road Map is to improve reliability of rail inspection, and reduce the number of broken rail derailments that are associated with them. One of the major tasks accomplished in 2008 was to develop and implement laser-based ultrasonic technology for rail inspection (Urail) in revenue service. Rail flaw simulations showed that there are non-inspectable areas when scanning from the top of the railhead with conventional UT technology. The sound path is influenced by rail wear, rail surface damage and the orientation of the flaw. Detection capability would likely increase if rail was inspected from other locations in addition to the top of the railhead. A prototype, laser-based ultrasonic inspection system was developed that is capable of inspecting the entire rail section. This system, which is based on triangulation between the laser beam and digital camera, provides real time adjustment of the laser sources and sensors compensate for geometrical changes in the rail section. While the technology is able to detect defects in the rail head, web and base, it generates a high number of false calls. Work is underway to identify and address problem areas. Efforts such as these ensure that the effects of wheel/rail interaction are solidly represented on the Technology Road Map.